The number of open, unfilled construction sector positions rose during the month of May over a slightly downwardly revised estimate for April. According to the BLS Job Openings and Labor Turnover Survey (JOLTS) and NAHB analysis, the number of open construction sector jobs (on a seasonally adjusted basis) increased from 137,000 (revised) in April to 149,000 in May. The May estimate is the fourth highest monthly total since the recession, with the March count standing as the cycle high point. On a three-month moving average basis, the open position rate for the construction sector declined slightly to 2.3% in May. The open rate has been trending upward since 2012. The three-month moving average for May remains near the cycle high set in March and April (2.4%). 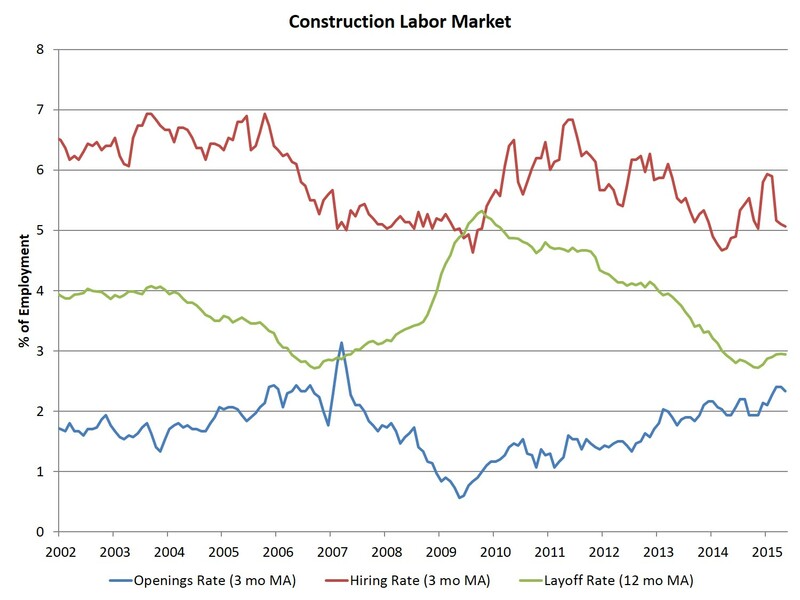 The May construction sector hiring rate, as measured on a three-month moving average basis, held steady at 5%. The May number of sector job quits was also relatively unchanged at 117,000. 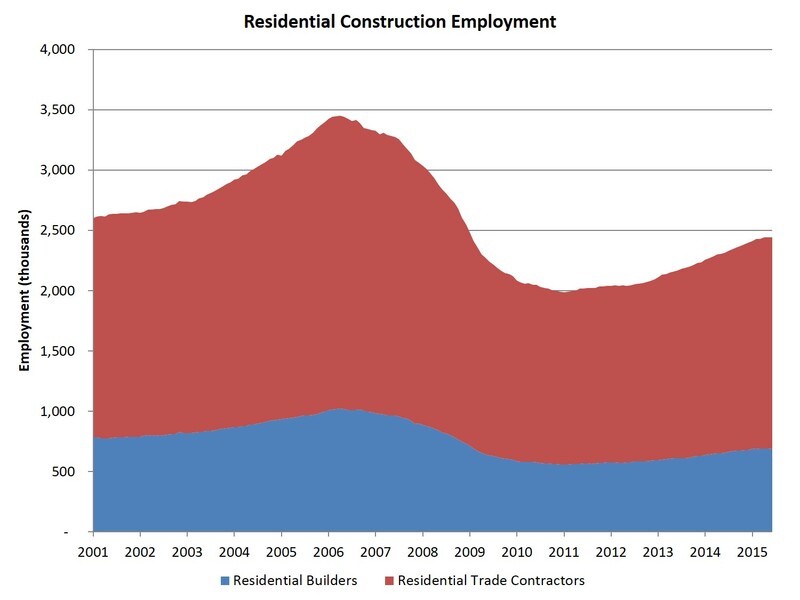 Monthly employment data for June 2015 (the employment count data from the BLS establishment survey are published one month ahead of the JOLTS data) indicate that total employment in home building/remodeling stands at 2.442 million, broken down as 686,000 builders and 1.755 million residential specialty trade contractors. In June, the number of jobs in home building and remodeling declined on seasonally adjusted basis for only the second time in the last two years, falling 2,400 for the month. The industry pace of hiring has slowed in 2015, with the average monthly employing gain standing at about 7,500 over the last six months. Nonetheless, over the last 12 months the industry has added 127,000 jobs on a net basis. Since the low point of industry employment following the Great Recession, the residential construction industry has gained 455,600 positions. In June, the unemployment rate for construction workers stood at 7% on a seasonally adjusted basis. The unemployment rate for the construction occupation has been on a general decline since reaching a peak rate of 22% in February 2010. Many builders continue to cite access to labor as a top business challenge as the market recovers. See this just published NAHB survey on the issue, focusing on builder and subcontractor workers. For the economy as a whole, the May JOLTS data indicate that the hiring rate fell to 3.5% of total employment. The overall job openings rate held steady at an elevated 3.6% rate. Rising job openings for the overall economy are affecting many business sectors as the unemployment rate falls.